This is the basic requirements of the ADS Syllabus, The grading examiner(s) may ask you to perform other techniques which are within your ability. Also, a grading may be conducted on a continual assessment basis without your knowledge and a final examination on the day, This examination may only be considered as part of your requirement to be successful in passing your next grade. Grade to 6th Kyu (Red Belt). Minimum Training requirements 20 hours and 6 Weeks from starting. 1. Ukemi, (Forward, Backward and Side Breakfalls). 2. Unsoku Undo and Tandoku Undo, (Knowledge of Foot and Hand Movements). 4. Kuzushi No Kata, (Number 1, 2, 3 Basic Movements). 1 Shomen Uchi. Irimi Nage. 2 Migi Yokomen Uchi. Ude Gaeshi. 3 Hidari Yokomen Uchi. Ushiro Ate. Grade to 5th Kyu (Yellow Belt). Minimum Training requirements 40 hours and 10 Weeks from red belt. 1. Ukemi, (Forward, Backward and Side Breakfalls) Improved. 2. Unsoku Undo and Tandoku Undo, (Improved Foot and Hand Movements). 3. Tagatana, (Tsugi Ashi and Shotai). 5. Kuzushi No Kata, (Basic Six Movements). 4 Shomen Uchi. Irim Ude Hineri. 5 Shomen Ate. Shiho Nage. 6 Shomen Ate. Kote Gaeshi (Reversed). Grade to 4th Kyu (Orange Belt). Minimum Training requirements 65 hours and 14 Weeks since 5th Kyu. You may be ask to perform any of the 5th Kyu syllabus as part of your grading. 5. Kuzushi No Kata, (Improved Basic Six Movements). Grade to 3rd Kyu (Green Belt). Minimum Training requirements 65 hours and 4 months since 4th Kyu. You may be ask to perform any of the 5th & 4th Kyu syllabus as part of your grading. 2. Unsoku Undo and Tandoku Undo. 7. Ure Waza, (Randori No Kata 10 Counters). 8. Renzoku Waza, (Continuouse Movement). 9. Tanto Tsuki, (Knife Evasion). 11. Follow Techniques as Demonstrated. Ure Waza (Randori No Kata 10 Counters). 1. Shomen Ate. Waka Gatame. 2. Aigamae Ate Oshi Taoshi. 3. Gyaku Gamae Ate. Gedan Ate. 4. Gedan Ate. Shomen Ate. 5. Ushiro Ate. Tenkai Kote Hineri. 6. Oshi Taoshi. Oshi Taoshi. 7. Hiki Taoshi. Tenkai Kote Hineri. 8. Kote Gaeshi. Kote Gaeshi. 9. Tenkai Kote Hineri Reverse Waka Gatame. 10. Shiho Nage. Shiho Nage. Grade to 2nd Kyu (Blue Belt). Minimum Training requirements 100 hours and 6 months since 3rd Kyu. You may be ask to perform any of the 5th to 3rd Kyu syllabus as part of your grading. 8. Gohon No Kuzushi, (Main Five of Randori No Kata Balance Breaking). 9. Renzoku Waza, (Continuouse Movement). 10. Tanto Tsuki, (Knife Evasion). 11. Happon No Kata, (1 8 of Koryu Dai On). 12. Tanto Randori No Kata. 14. Follow Techniques as Demonstrated. Grade to 1st Kyu (Brown Belt). Minimum Training requirements 160 hours and 9 months since 2nd Kyu. You may be ask to perform any of the 5th to 2nd Kyu syllabus as part of your grading. 8. Gohon No Kuzushi (Main Five of Randori No Kata Balance Breaking). 9. Renzoku Waza (Continuouse Movement). 10. Tanto Tsuki (Knife Evasion). 11. Happon No Kata (1 16 of Koryu Dai On). 12. Koryu Dai San. (1 16). 13. Tanto Randori (Free Style). 16. Follow Techniques as Demonstrated. Happon No Kata, (1 – 16 of Koryu Dai Yon). 9. Migi Katate Dori with counter technique. 10. Hidari Katate Dori with counter technique. 11. Migi Katate Dori with counter technique. 12. Hidari Katate Dori with counter technique. 13. Migi Katate Dori with counter technique. 14. Hitari Katate Dori with counter technique. 15. Ushiro Ryote Dori with counter technique. 16. Morote Dori with counter technique. Koryu Dai San, (1 – 16). 1. Shomen Ate. Irimi Nage. 2. Yokomen Uchi Gyaku Gamae Ate. 3. Choku Tsuki. Kote Gaeshi. 4. Ryote Dori. Kata Otoshi. 5. Ushiro Ryote Muna Dori. Tenkai Kote Hineri. 6. Katate Dori. Shiho Nage. 7. Kata Dori. Hiza Ate. 8. Muna Dori. Mae Otoshi. 9. Muna Dori. Gyaku Gamae Ate. 10. Katate Dori. Tenkai Ude Hineri (Kaitan Nage). 11. Kata Dori. Gyaku Gamae Ate. 12. Katate Dori. Ushiro Otoshi. 13. Ryote Kata Dori. Tenkai Mae Otoshi. 14. Ushiro Ryote Dori. Mae Otoshi. 15. Ushiro Ryote Kata Dori. Tenkai Kote Hineri. 16. Kata Dori. Hiza Ate kata Gatame. Grade to 1st Dan (Black Belt). Minimum Training requirements 200 hours and 12 months since 1st Kyu. You may be ask to perform any of the 5th to 1st Kyu syllabus as part of your grading. 9. Happon No Kata (1 27 of Koryu Dai On). 10. Koryu Dai San. (1 24). 11. Renzoku Waza (Continuouse Movement). 12. Tanto Randori (Free Style). 15. Suburi Waza (Sword Cuts, Posture Movement). Koryu Dai Yon (1 – 27). 17. Migi Gyaku Gamae Ate. 18. Hidari Gyaku Gamae Ate. 19. Uchinage or Uchi Kaiten Nage. 21. Ushiro Waza Kote Gaeshi. 26. Ryote Mochi Uki Otoshi. Koryu Dai San. (1 – 24). 2. Yokomen Uchi. Gyaku Gamae Ate. 17. Shomen Uchi. Ushiro Ate. 18. Migi Yokomen Uchi. Gyaku Gamae Ate. 19. Hidari Yokomen Uchi. Tenkan Nage. 20. Tanto Tsuki. Ushiro Ate. 21. Gedan Yokomen Uchi. Kata Gatame. 22. Gyaku Gedan Yokomen Uchi. Kote Gaeshi. 23. Tanto Tsuki Tenkai Kote Hineri. Grade to 2nd Dan (Black Belt). Minimum Training requirements 300 hours and 18 months since 1st Dan. You may be ask to perform any of the 5th Kyu to 1st Dan syllabus as part of your grading. 10. Koryu Dai San. (All). Grade to 3rd Dan (Black Belt). Minimum Training requirements 400 hours and 24 months since 2nd Dan. 1. Perform any of the previous syllabus if requested. 2. 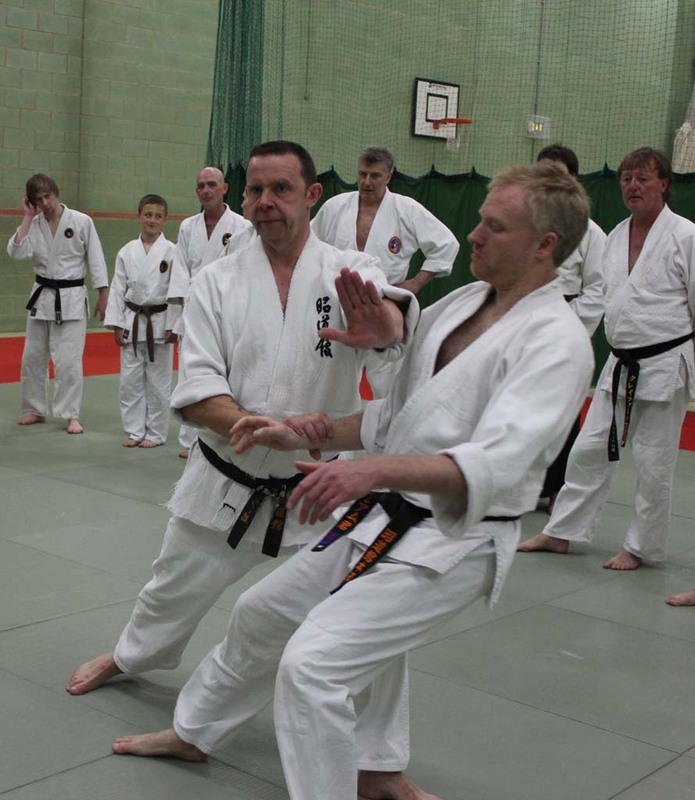 Demonstrate any Koryu Kata not previously demonstrated in a grading. suitable by the grading panel. 4. Teach at least 3 of the techniques from own kata to class present at grading. Two weeks prior to the grading submit the following to the grading panel. Written documentation of your own Kata.using a sequence of still photographs or video footage of own Kata. Grade to 4th Dan (Black Belt). Grade to 5th Dan (Black Belt). Minimum Training requirements 36 months since 4th Dan.